Winner! Winner! - AutoNetTV Media, Inc.
AutoNetTV won three Automotive Communications Awards in Las Vegas at the 2016 AAPEX show. In this interview, Sparky talks with Chris Steele about his award. Playing the hero, Sparky is at the beach with Cami, his leading lady, where he feels like a 90-pound weakling when a highly accessorized rival rolls by. After getting kitted out, Sparky is proud of his new look. This video is designed to promote the sales of accessories in auto parts stores and service facilities. The purpose is to encourage consumers to personalize their vehicles with aftermarket accessories. The final video represents 84 hours of 3D animation and 10 hours of post-production and sound design. The entire project was managed and created in-house by AutoNetTV Productions. 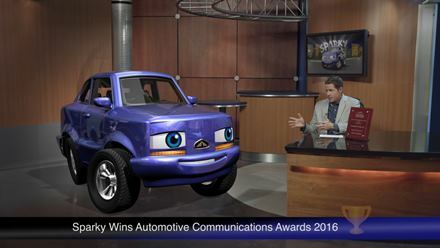 Sparky’s wasn’t the only award AutoNetTV received in the competition. This 30-second video won in the TV commercial category and addresses a common dilemma motorists face when their Check Engine Light comes on. Let’s face it – the Check Engine Light is a mystery to many consumers: hundreds of trouble codes and one little light. No wonder people just want it to go away. This consumer-facing video takes a whimsical look at the lengths to which one motorist would go to simply “cover-up” his pesky Check Engine Light. This 30-second video is one of a series of 17 videos covering five topics that can be customized for individual shops for use in television commercials as well as social media, website, and digital signage use. Customization includes script integration, logo, graphics, and the voice artist of their choice. The entire project was conceived and created by AutoNetTV Productions. The third award winner is this video, created to open the AASA 2016 Vision Conference. The theme of the conference was “Connected with the Aftermarket”, exploring the present and future of the connected car and telematics. Five related topics were chosen for short vignettes depicting benefits of the connected car, some of the connected technology challenges facing the aftermarket, as well as future opportunities for enhanced efficiency in the distribution chain. The vignettes feature a photo-realistic 3D animated vehicle and motion graphics presented in a simple, distraction-free environment. The final video represents 54 hours of 3D animation, 95 hours of motion graphics work, 16 hours of post-production and sound design, and 36 hours of creative (storyboarding). The entire project was managed and created in-house by AutoNetTV Productions. AutoNetTV has won a total of 12 ACA Awards.